The Graduate Teaching Associate (GTA) program in the School of Communication provides exceptional training for a variety of career paths. The program has produced corporate trainers, communication consultants, human resources professionals, communications directors, community college teachers, and university professors. The program offers two levels of appointment. The first entails teaching three 50-minute breakout sections of COMM 103 Oral Communication, a course taken by roughly 98% of all SDSU students. Duties include, but may not be limited to: grading outlines and speeches, leading classes in public speaking activities, and reinforcing large lecture material through discussions and activities. The second, more competitively-selected level of appointment involves teaching 3 breakout sections of COMM 103 and performing other duties as assigned by the School Director for an additional 4.5 hours per week, such as assisting a professor in a large class, assisting the Director of Graduate Studies, advising undergraduate students, or other assignments. Each appointment level comes with a 12 month stipend. Health care benefits come with the second level of appointment. All GTAs receive office space and a campus mailbox. In addition to meeting with COMM 103 classes (about 20 students each), GTAs are responsible for attending one large lecture a week (taught by the Basic Course Director). All GTAs must also attend GTA orientation the week before the Fall semester (usually the 2nd or 3rd week of August) and a weekly mentoring meeting during the Fall and Spring semester. Students applying to the MA program in Communication are eligible to apply to the GTA program and are selected on the same criteria; no prior teaching experience is needed. Applicants are encouraged to mention their interest in the GTA program on their Statement of Purpose. Our Graduate Teaching Associates (GTAs) are provided a unique opportunity in the classroom. GTAs lead and teach three Small Sections in conjunction with a Large Lecture for our Communication 103 course: Oral Communication. On average, there are 20 freshmen per section for which you will be responsible for explaining assignments, creating and leading exercises, developing skills, and grading presentations. While the syllabus and major assignments are created for you, you still have a lot of autonomy in the classroom to be creative and original. Because many of our GTAs are new to teaching, we provide a week long orientation that covers everything from creating lesson plans to grading speeches, and includes topics like how to schedule office hours. Weekly meetings are held to continue training and mentoring through the semester. The camaraderie among the GTAs stems from sharing an office with each other and often developing activities and lesson plans together. 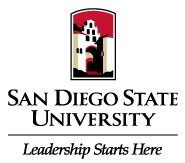 Being a GTA is an excellent way to complete the Graduate Student experience with the School of Communication at SDSU!